Join the Strathspey Railway for a vintage diesel railcar trip with stunning views of the Cairngorms National Park scenery! The full 20-mile return trip lasts around 1 hour and 35 minutes departing Aviemore visiting Boat of Garten and Broomhill stations. We’ll take you on a truly scenic vintage DMU railcar journey between Aviemore, Boat of Garten and Broomhill. 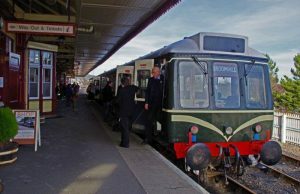 Please note that this service will be hauled by a historic diesel railcar engine. Dogs are permitted on these services..